Premium Lifestyles Brisbane build and design stylish patios that will enhance your home and allow you to enjoy a relaxed outdoor lifestyle. We provide rustic, simple, complex and ultra-modern designs and our quality materials mean your patio is built to last. When we design your patio, we take into account your budget and we always offer outstanding value for money. Let our patio experts show you how your patio design can merge structures and landscape into one luxurious living space. Call 3300 0507 or email us today for a FREE in-home measure and PATIO DESIGN. Freshen up your outdoor entertaining area with an arched or domed patio. Arched patios have become increasingly popular for those who seek unique and contemporary settings. The arched patio allows you to entertain in high style, giving a spacious feel to even a small patio area. The design of an arched or domed patio helps you and your guests keep your cool, as it shields you from harmful sun-rays and effectively reduces the heat with its elevation. A gable roof over your patio creates the ideal opening to a formal garden and is a traditional and effective way to make you and your guests feel right at home in the outdoors. Similar to an arch, the gable gives your patio area the feel of extra space while the high pitch of the gable allows the heat to rise and escape. The simplicity of a flat roof patio lets you maintain a conventional patio design, yet may still add class and sophistication to your outdoor area. Choose the pitch of your flat roof, either towards or away from your house, to create either a modern or a rustic look in classic patio style. Get great patio ideas and designs: View our Gallery of custom built patios. Why Premium Lifestyles for Patios Brisbane ? Premium Lifestyles are a leading Brisbane builder and designer that offers value for money and outstanding quality. 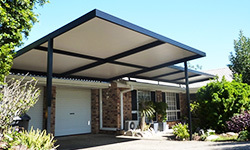 Our team has over 25 years experience and we create patios, decks, pergolas, verandas, carports and weatherboard garages that help you transform your landscape into functional, stylish and appealing living spaces. Our expert team of professional trade and design staff have the knowledge and experience to conceptualize, plan, draft and build both simple and more complex designs according to your budget. Whether you need a patio or deck for outdoor entertaining, pool decking or a new carport, we can help you improve the value, functionality and livability of your home or commercial property. We offer a 7-YEAR WARRANTY and every one of our premium structures is built to last. Premium Lifestyles are OPEN 7 DAYS and service ALL Brisbane suburbs including Brisbane North, West, East and South. We also service areas within a 100km radius of Brisbane such as Gold Coast, Ipswich and Sunshine Coast. Contact us today so we can create your dream patio!